Pubs in one town in north-west England could introduce organised queuing. It's a drastic solution to what can seem to be a mysterious art - getting served at a busy bar. Britain may be a nation of queuers, but the thought of lining up in an orderly fashion at a bar is enough to turn many a drinker's beer flat. But that's what patrons of busy town centre pubs in Oldham may find themselves doing if plans for post office-style queues go ahead to deter trouble. For the rest of us, getting served at a heaving bar remains a challenge born out of frustration. So what's the secret to having good bar presence? Here's 10 points to bear in mind next time you find yourself in a crush at the bar. Before you even get the chance to prop yourself within ordering distance of the frenetic bar staff, you need to reach the bar itself. In a teeming hostelry where the throng of eager drinkers can be five deep, that's no mean task. Some snake a hand through the crowd and draw themselves in, others wait until the person in front has ordered, then try to roll around them to claim their space. The latter technique requires "cunning, anticipation and skill", observes seasoned pub-goer Matt Eley. 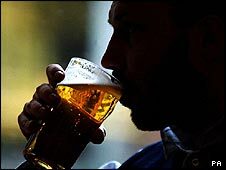 He should know - as a reporter for the industry newspaper The Publican he spends more time in licensed venues than most. Just as pubs subvert the British rules on forming an orderly line, so they do when it comes to meeting a stranger's eyes - a near-treasonous act in most spheres of public life. As duty manager of Wetherspoons' Time Piece pub in Dewsbury, Gemma Barua, 26, knows a thing or two about being on the other side of a heaving bar. "Always try to catch people's eyes," is her number one rule. "We try to acknowledge people when they're waiting. We know it's frustrating. If you catch my eye and smile nicely I will remember," she says. Mr Eley suggests finding a spot near the till to boost that all important eye contact opportunity. 3. TO FLIRT OR NOT TO FLIRT? For Jon Howard, of the Campaign for Real Ale (Camra), the secret to getting served is... send someone else up, if it's a man taking the orders. A seductive flicking of blonde hair is guaranteed to arrest the barman's attention, he believes. Not so, says Richard Grant, of the White Swan pub in Richmond, Surrey. Women who lean over the bar to flirt rarely get served quicker. "We know they don't want anything else apart from drinks. I'm too old to be wooed by someone trying to flatter me," says the 36-year-old general manager. Tapping coins on the bar, shouting "me next, me next", or just barking your order are effective ways to get noticed and ignored at the same time, says Ms Barua. "For some reason coin tapping grates on me more than anything else, the others are easier to ignore." Whistling or finger clicking are no better, says Mr Grant. "We're not dogs." Here's one subtle, calculated technique that can be highly effective, as Mr Eley, of The Publican, explains. "When the bartender is scanning the sea of eager faces at the bar and trying to work out who is next, point to the person next to you," he says. 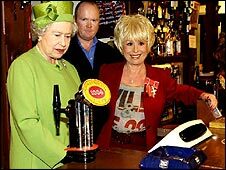 "They will get served and then usually you will be next, the bar staff having acknowledged your impeccable etiquette." Ms Barua agrees, believing that it's a way of rewarding someone who has been helpful. 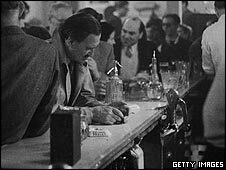 It may be quieter than coin tapping, but waving a banknote under the gaze of the bartender is destined to have the opposite effect on weary bar staff. Just listen to Ms Barua: "People try to wave notes at you across the bar and that's not the way to get served, folks. If money is waved in my face I'm tempted to take it off them and pretend to put it in the charity box to give a subtle hint." Barman Russell Grainger, 21, of Ascot, Berkshire, confesses to feeling irritated at the sight of a thrust-out tenner. "It's kind of 'this is my money and I want to be served now'," he says. Silence can be golden when it comes to effective bar etiquette. Mr Grainger says he dislikes people who make "nasty comments" from behind the bar about how long they've been waiting. And Ms Barua struggles to find the funny side of all those "I'm dying of thirst" murmurs. It may sound jokey but she often detects a more sinister undertone - that she's not working fast enough. Loyalty and politeness will get you a long way, says pub manager Mr Grant. But the best ploy by a long chalk is a simple three word phrase: "Have one yourself." 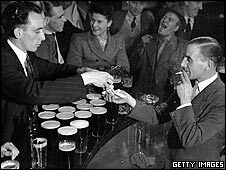 Bar workers now are often dissuaded from drinking on the job - but instead will take the money as a gratuity. Given the price of a pint nowadays, that's not a bad tip. Camra's Jon Howard speaks from experience when he confirms it's one sure way to be remembered. As with so many things, timing is key, says Mr Howard. If standing at the bar puts you in mind of the Harrods' sale you might be encountering the licensed trade's equivalent of rush hour. People tend to visit the pub half-an-hour, an hour or two hours before closing, he says. So turning up at, say, 10 past the hour could be effective. If you don't like the sound of Oldham's plan for orderly queuing, there are more unusual ways to avoid waiting. One village pub in East Sussex allows regulars to pour their own pints at the side of the bar and put their payment in an "honesty box". IT company MyQbuster invented a system allowing drinkers to order through a mobile phone from their seats, with orders automatically appearing on the touch screen till at the bar. And if all these pointers fail you the next time you land in a bustling tavern - maybe it's time to go on the wagon.